Seattle, WA, December 2012 – Synergia Northwest Presents announces its 2013 event “Music Lessons Matter” scheduled for May 18, 2013 at the Moore Theatre in Seattle, Washington. The concert will feature the Synergia Northwest Orchestra alongside some of the Pacific Northwest’s most high profile rock and pop recording artists and student musicians. Top Northwest radio personality Marty Riemer will return to emcee this years event. As part of the night’s multiple performances the concert will again highlight a special musical tribute. “Music Lessons Matter” will feature a tribute to the music of The Rolling Stones; past tributes have included music from The Beatles and Sir Elton John. 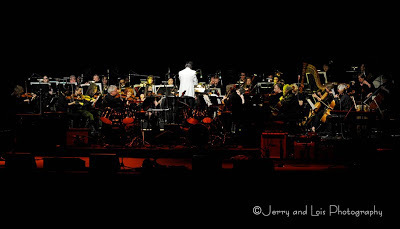 The series is now in its fourth year and artists performing with the 50 piece Synergia Northwest Orchestra have included members of Heart, Pearl Jam, Alice In Chains, Blues Traveler, Alan White and White, Tracy Bonham, Queensryche and other internationally recognized artists who call Washington State their home. The concerts have also given a showcase to the area’s heritage rich, diverse music community such as the groundbreaking music of the late artist and Northwest Native American Beaver Chief, KOKON Taiko with the Seattle Seahawk’s Blue Thunder Drum Line and acclaimed drummer Alan White and Dora Oliveira’s Samba Reggae Revolution. The efforts of Synergia Northwest events over the past few years have helped Music Aid Northwest in bringing its“Music Matters” license plate fundraising proposal to fruition by raising capital needed to create a music-themed license plate that helps support school music programs through its sales. Music Matters license plates now can be purchased through any Washington State Department of Licensing (DOL) office. This year Synergia Northwest is expanding its focus to direct service agencies in particular Seattle Music Partnerswho provides a free after-school music program for underserved elementary school students in Seattle’s Central District. SMP recruits, trains and supports skilled high school, college-aged and community musicians as volunteer music tutors and mentors who lead one-on-one music lessons each week. These lessons are supplemented with a second afternoon of group instruction and ensemble work. It also provides instruments to participants as well as transportation when needed. Like Synergia Northwest Presents, Seattle Music Partners believe that providing a child with the opportunity to build a foundation of musical skills, coupled with the strength of a mentoring relationship, help foster self-confidence and an overall engagement in learning. “We definitely are making an impact and as we grow this thing year to year we foresee more opportunity for young kids to be involved in music programs.” said Executive Producer and Music Director Michael McMorrow. “The absolute uniqueness of this event coupled with the vast talent and community oriented business leaders right here in the northwest are creating the perfect storm for success. 2013 will be a banner year for Synergia Northwest.” Seattle musician McMorrow also has hinted to other projects involving student musicians that are in various stages of development. Synergia Northwest Presents blends classical, contemporary, professional and student musicians into one evening of performances that unifies cultures and musical genres. The caliber of these artists, all with Washington State ties, along with a world-class conductor and orchestra has promised an evening of unforgettable musical moments that have left audiences knowing they’ve just experienced a magical event. “Music Lessons Matter” initial performers and pre-sale ticket information will be announced soon. For more information on “Music Lessons Matter” , visit http://www.synergianorthwest.com/ andwww.seattlemusicpartners.org .